When you get right down to it we are all related in some way. If you go back far enough in our family trees we end up being related to most people. The population of the world (as I understand it) has steadily grown over the centuries suggesting that a few centuries back the population was less. Mathematically each time you trace back a generation you double the size of just your direct family line, for example, you have yourself, two parents, four grandparents, eight great grandparents, sixteen great grandparents, 32 great great grandparents etc., until we begin connecting with people that we did not even know existed as part of our family tree. For example, the past two weeks I have been corresponding with a gentleman that I discovered on the Danish Message boards who had a common ancestor as mine by the last name of Christopher Enevoldsen and Ellen Jensen. This in and of itself is not surprising, but as we corresponded via email, it turns out that this person lives in the same city as I and is only about 10 minutes away at the most. Now that is amazing. Christopher and Ellen had 11 children, several who died in childhood. We determined that this couple was my 7th Great Grandparents and my newly found distant(not so distant) cousin's 6th Great Grandparents. Interestingly enough the connection occurs on both of our maternal lines. The picture to the right is of myself and my new found cousin and neighbor Gil. 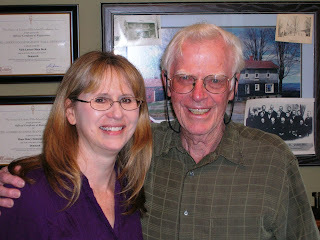 I went over to visit with him at his home with my oldest son and had a wonderful time comparing our records and pictures. After our initial meeting, we have also shared GEDCOM files and plan to get together in the future and meet the rest of each other's family. You might wonder why I have blogged concerning this experience. The main reason is to reinforce the fact that researching your ancestors encourages a cooperative effort between researchers/cousins. I would also suggest that working with genealogical message boards can be highly successful with little time and effort spent. My cousin posted to the Danish message board approximately 2 years ago. I emailed him thinking that the email address probably changed (which they can) but I figured I might as well try and make the connection. I was fortunate in being able to make another connection as he had not changed his email from two years ago. I have been highly successful in making connections with unknown cousins when utilizing genealogical message boards. I have meet three cousins in England, one in New Zealand, and two in California. My favorite message boards are located at RootsWeb and now Dis-Forum. I would urge you try your hand on these message boards and you will be happy that you did. If you have questions concerning using message boards feel free to post a comment and I will answer your questions with a response. Have fun!